Drum circles have become especially prolific in health and wellness as well as business environments. 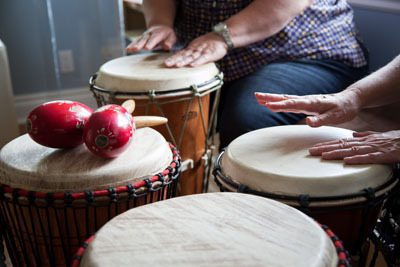 In the uplifting and nurturing environment of Wellspring, participants are empowered by the reinforcement of community and the joy of drumming together. It is invigorating! Participants gather in a circle as the facilitator provides direction in playing hand drums from around the world. After simple instruction, everyone finds their rhythm. You will find this enjoyable and a great way to reduce stress.